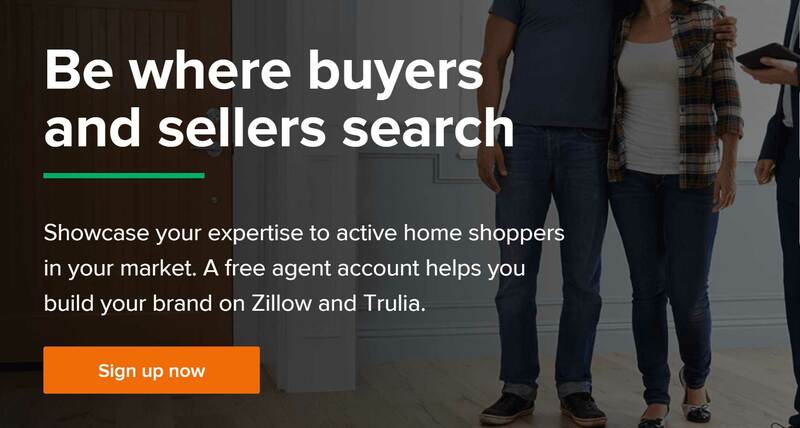 Zillow is the largest online real estate marketplace, providing consumers with real estate data and connecting them to local real estate professionals. It is often the consumer’s first point of contact with potential realtors. As a real estate agent, you maintain a Zillow agent profile that displays your contact information, active listings, past sales, and ratings/reviews. Your average star rating and total number of reviews is prominently displayed, accompanying your name when anyone does an agent search on Zillow, as well as anytime you appear next to a listing. Your online reputation is a huge factor in the growth and success of your real estate business. Make it work for you with 5starRocket’s complete review management tool. Click Agent Finder from the top menu of the homepage and select Create a Free Agent Account from the I’m a Pro section of the menu. This will take you to the Premier Agent Zillow site. Click on the orange Sign Up Now button to begin creating your profile. It is free to make an agent profile on Zillow, but there are options to pay to advertise through Zillow as well. Reviewers can click on Agent Finder in the top menu of the Zillow homepage and select Real Estate Agents in the Looking for Pros section. They will type your name into the Find an Agent search box and then see a list of potential matches. When they see your profile, they will click on your name to go to your profile page. On your profile page, they should scroll down to the Ratings and Reviews section and click the blue Write a Review box to write their review. Reviewers need to have a Zillow account, or sign in with Google+ or Facebook, to write a review. They will be prompted to log in or start an account at the bottom of the review process. Final Thoughts: Zillow is often the first place real estate buyers and sellers go when they are entering the market. Your reputation and Zillow Agent profile can have a huge impact on whether they choose you as their real estate agent. Find out how you can effectively manage your online reputation with the most powerful real estate online review management tool out there, 5starRocket!